The 5th edition of Hartman Publishing’s best-selling home health aide training textbook, Providing Home Care: A Textbook for Home Health Aides, is here! We listened carefully to thousands of instructors who shared with us what they want in a home health aide training textbook. Click here to learn more about our videos. Designed to help students review what they have learned from reading the textbook, the workbook is organized around Learning Objectives, which work like a built-in study guide. Multiple choice and true/false questions, crossword puzzles, critical thinking scenarios, and other activities test the student’s knowledge of each chapter. Our skills videos help prepare students for their clinical skills testing. Upon adoption, we provide easy web access for instructors and their students at no extra charge. For more information about Hartman’s new skill videos, please click here. The instructor’s guide to teaching from our textbook contains the following elements for every chapter: an overview of teaching strategies; page references for both the textbook and student workbook; teaching outlines for every Learning Objective; a chapter review which may contain case studies, role-playing scenarios, games, discussion questions, and two sets of chapter exams, along with a final exam. The instructor can modify the exams to suit his or her needs. Our customers consistently tell us that we offer the most competitive pricing in the market. 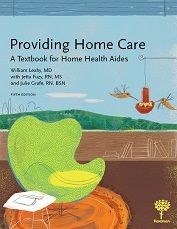 Click here to see other home health aide textbooks.